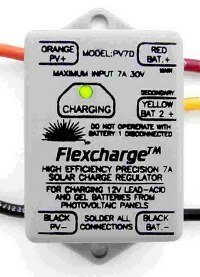 We can special order any of the flexcharge line. with either conventional flooded or sealed batteries. The Flexcharge charging algorithim extends the life of your battery. Made in the U.S. by Seelye Equipment Specialists. The PV7D is shown on this page. amps when optional external contactors are added. Safely Micro Equalizes Wet Cell Lead Acid and Sealed Gel battery technologies using the Energy State Taper Charge Process. Expands easily into a high amperage controller. Up to 500A charging capacity with a charging efficiency increase to 99.95%. Factory Calibrated for charging lead acid and gel battery technologies. No user adjustments. This charge controller can be used with one or two battery(s). salt water spray resistant, and very small (1.5" x 2"). They are ideal for use in a marine environment. Use with Lead Acid or Gel battery technologies. They use only 4mA to operate the circuitry. Includes an easy to read Charge Indicator. These charge controllers produce NO Radio Frequency Interference. four wire pigtails, either by soldering or on to a owner supplied terminal strip. is a dual battery charge controller. It will charge one or two different batteries (or battery banks). state of charge and will send power to that battery. The PV7D also isolates the two batteries from each other. system and a house battery system.